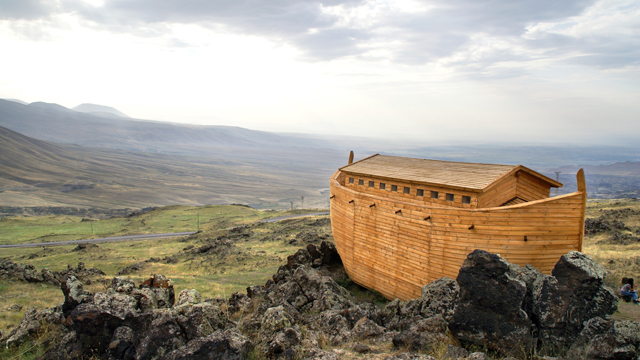 The Creator tells Noah that the world is going to be destroyed, and so He wants him to take 120 years to build a teyvat, an Ark, through which he and his family will be saved. All the people of the generation laughed at him, telling him that if a flood did come, it would go on the house of Methushelach, a great tzadik and righteous soul who lived at that time. They said they would all be saved, except Methushelach. However, the Midrash continues that after Methushelach died, all the people then told Noah that if the Mabul, the Flood, happened, everybody else would live and he would be the one to die. How could they be so wrong? How could they be so off in their view of themselves, in their view of Noah, in their view of the world? The answer is important; it is that the worst part of falling is not that we fall. It is that we think we are right. It’s easy for us to think that we are right, that we are on the right path, and there is a deep spiritual reason why. There’s a book called Lev David compiled and written partly by Rav Chaim Yosef David Azulai, the Chida. The first few chapters are from Rav Chaim Vital, the great student of the Ari, and I want to share a powerful teaching from him. There are two steps in the process when a soul leaves this world. The soul first leaves the body in the process that occurs moments before and at death. And then, Rav Chaim Vital tells us, angels come and take the soul on a path that should take 150 years. They lead it up to the gateways, to the entrance to the Supernal World. We think, mistakenly, that when our soul leaves this world, the Creator decides if we are going to heaven or going to hell. But it doesn’t work that way. Just as we learned previously that there is no angel of death, but rather that the person builds his own angel of death, so too in the Supernal Worlds when the soul leaves the body, God doesn’t decide where we are going – we do. Amongst these 32,000 paths of darkness is one path called the Orach Chaim, the Path of Life; this is true both when a person leaves this world and also when he is in this world. There is only one clear path, and there are 32,000 other paths that simulate a good path, but lead us towards darkness. Rav Ashlag tells us that when the soul comes into this world, it’s put on the one path, the Orach Chaim, that we are meant to go straight on. But then a test comes - ego, Desire to Receive for the Self Alone – and we fall. We open up from this straight pathway into one of the 32,000 others. And we can keep going, thinking that we are going in the right way, but we are really on one of those 32,000 paths; however, through a process of correction and restriction, a person can find his way back onto the Orach Chaim, the one singular path. When we can begin to understand these two things - first, that there is only one path from where we are towards a real connection to the Light of the Creator, and second, that there are 32,000 other paths that seem to be good, but are not - we begin to appreciate the precision with which we have to go about our spiritual work. The kabbalists teach it’s not a coincidence that there are exactly 32,000. Because every individual throughout his lifetime goes through 32,000 tests - sometimes big, sometimes small. If a person is able to clean his path and not fall in those 32,000 tests, which comes out to about a test or so a day, then when the soul leaves this world, the path is clear. It is important to point out, as Rav Chaim Vital adds, the Path of Life will not be all great Light, blessings, and joy all the way through, as some of us may think. In fact, if a soul has chosen the right path, the first three days are going to be dark, and we are always going to have the choice to leave and go to one of the 32,000 other paths. But if a person perseveres through those three days of darkness, then he is on the Path of the Righteous which leads to greater and greater Light. This is true of both the path that an individual has to go on in this world, and the path that a person prepares for his soul after he leaves this world. And so, the generation of Noah were certain that they were on the right path, were certain that if a flood was going to come they were going to be saved. The question was, how could they be so wrong… and therefore, how often are we all wrong? The answer, one of the most important lessons that we can learn on this Shabbat, is the secret that Rav Chaim Vital reveals to us: that the 32,000 other pathways most times seem to be the right and clear ones. We have to appreciate that the spiritual path is not approximate. Out of the 32,000 paths there is only one precise pathway that leads us towards a pure and complete connection to the Light of the Creator. And the only way to make sure we are on that path is by the seriousness and preciseness of our spiritual work. A great way to explain this, perhaps, is like a person walking on a tightrope; he knows that the path is very narrow and precise. If he falls even a little bit to the right or a little bit to the left, he will fall. We have to understand that on any given day there is going to be a doorway open to one of those 32,000 other paths. We have to make sure that we stay on the one Path of Life, or come back to it if we’ve fallen off of it. Because it’s a precise process, a precise pathway, and it is with that precision which we must take our spiritual work.